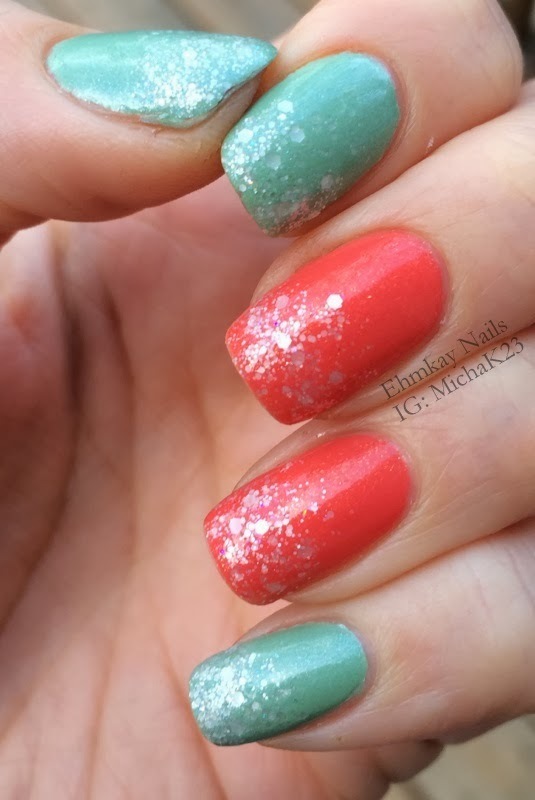 Here's a special polish from the lovely lady behind the blog, Superficially Colorful. Jin is so sweet and has been making polish for herself for quite a while, and sent me some to try. I'll be showing you the four others later because I put this on and simply couldn't take it off! I kept it on for four days, which is a lot for me. 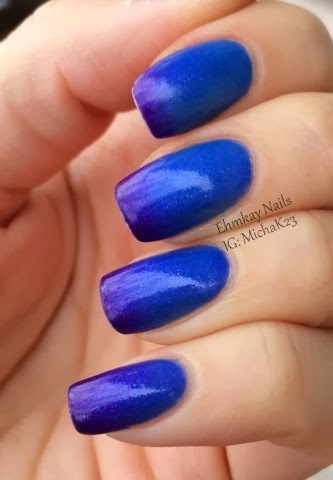 Fascinated in its cold form, is a gorgeous deep shimmery purple. The shimmer is strong. I actually put it on because it had matched my purple pants. 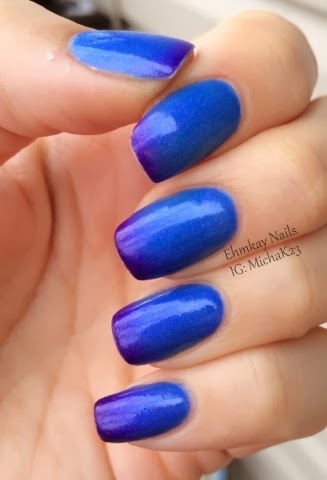 When you are warm, it turns to a gorgeous deep cornflower blue with that same shimmer. For me, it was mostly purple because it's always freezing here right now, so I guess I should save my thermals for the summer! Haha. No sun STILL, so I had to use flash to show off the shimmer, but it is very strong (but not so strong that it's frosty). 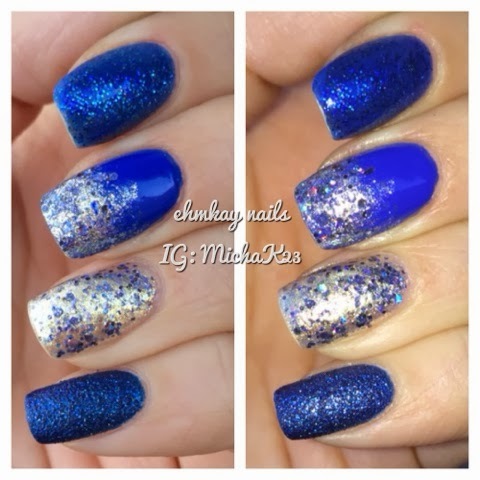 Here's way too many pictures to show you the variety in this thermal polish. These aren't for sale right now, but Jin does plan to open up shop soon. I HIGHLY suggest you check out her blog and I'll be sure to update this post once her shop is open. Winter is still rearing its ugly head in the Northeast and we just keep getting freezing temperatures and snow. Go away! 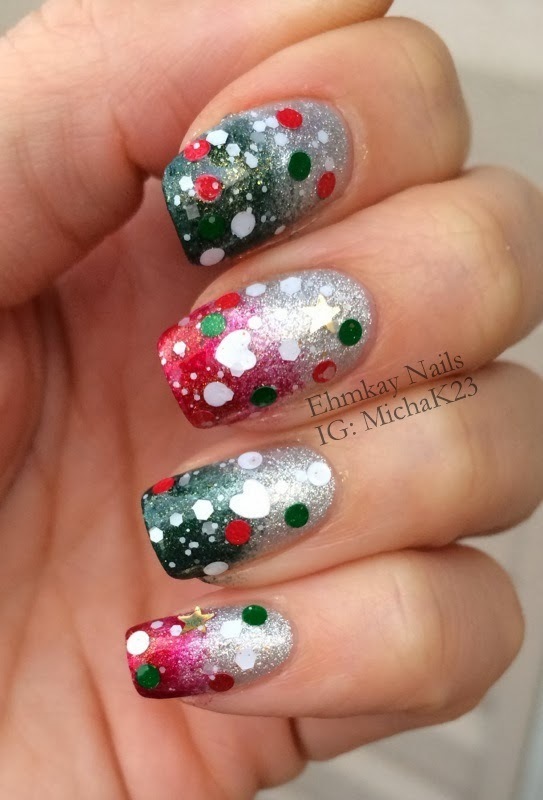 I actually saw my socks, which remind me of one of those "Ugly Christmas Sweater" themes and they inspired me to do my nails! It's fun to find inspiration in everyday items. 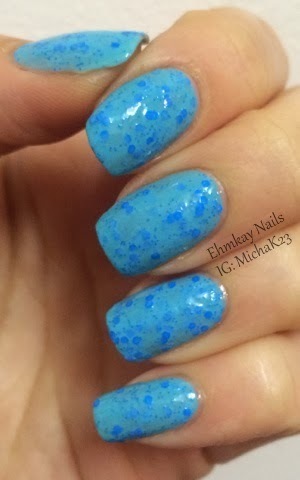 I started with two coats of Island Girl Island Heat which is a blight blue creme with darker blue glitter in it. It's bright but also wintry. 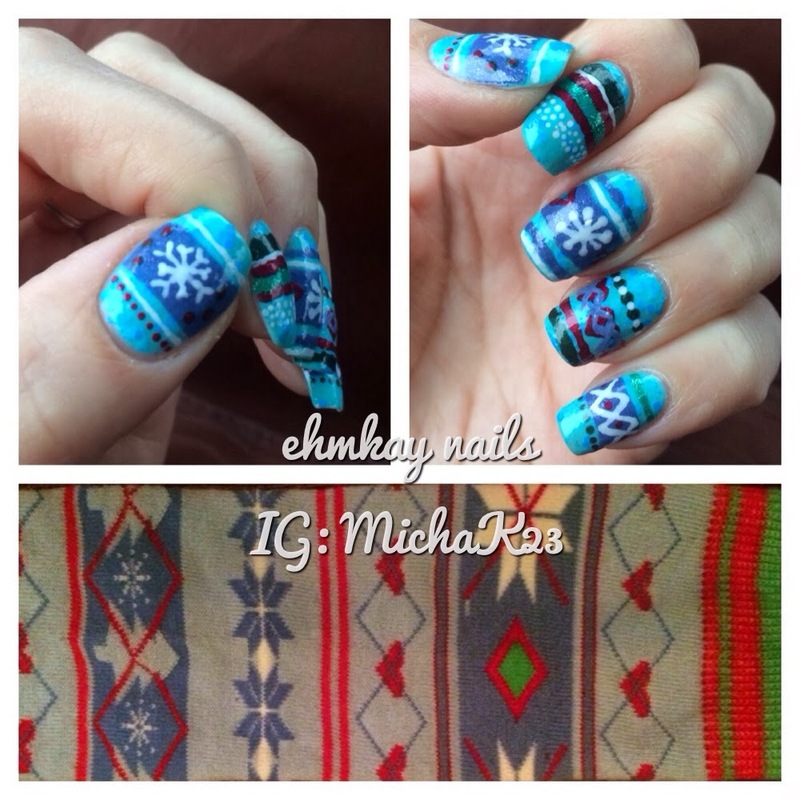 If I wore it alone, I would have done three thin coats, but two sufficed as my background to nail art. It's obviously not exact to the sock, but that's why I say inspired by. It's not perfect and the lines aren't straight but that's okay with nail art. We are human and it's not supposed to be perfect. 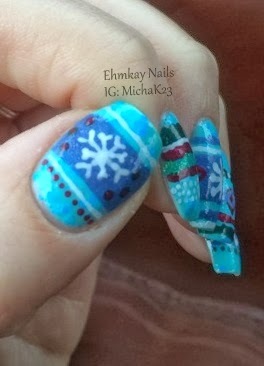 I used Essie Smooth Sailing, OPI My Boyfriend Scales Wall, Zoya Verushka, and Zoya Posh to paint on the details. I have a lot of cool socks. I should look at them more often. 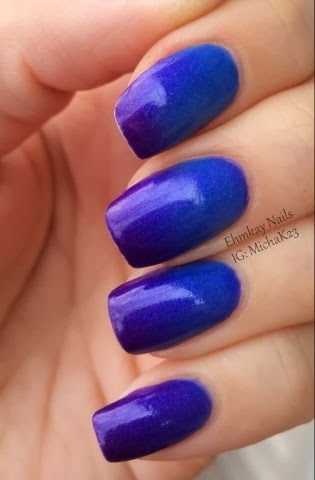 Do you ever have polishes laying out (either on your Helmer, or your desk, or wherever) and boom, they look like a manicure match made in heaven?! 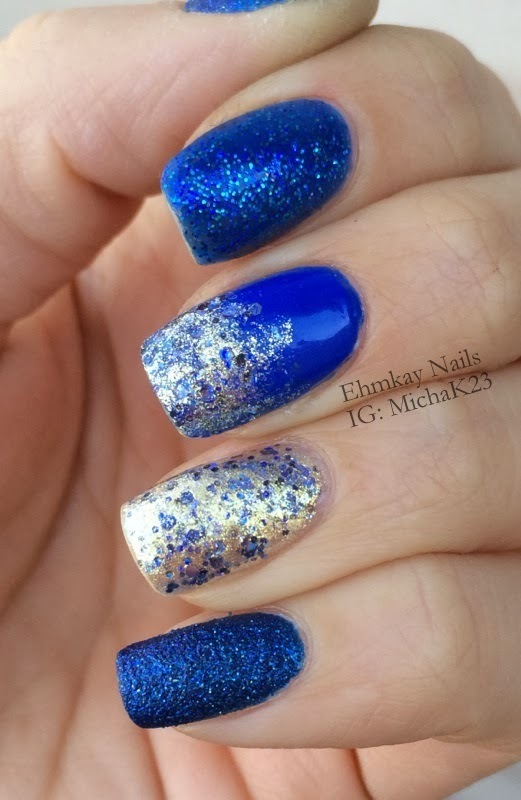 The awesome Jen from My Nail Polish Obsession sent me over these two gorgeous Essies from their winter collection: On a Silver Platter and Lots of Lux--I wanted to use them somehow together. So, rather than skitlette, I did a SKITTLE mani (this is when each nail is different) all in the same rich, lapis blue color scheme. 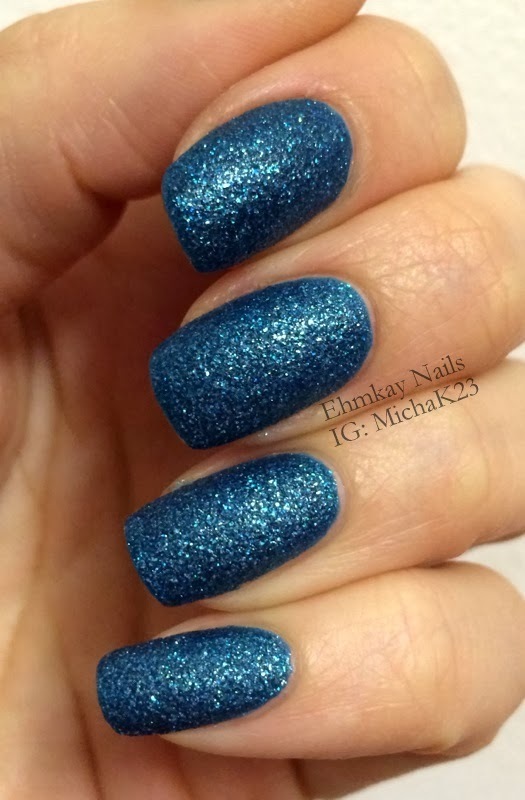 Index: Kiko Digital Glitter Electron Blue, two coats. 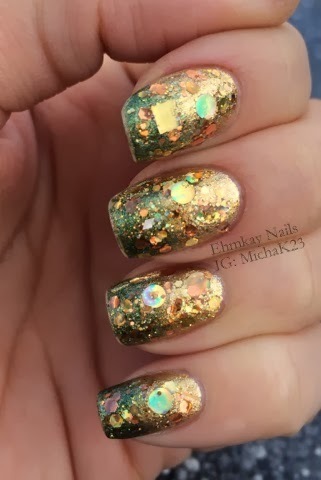 The sparkle of this polish did not was to photograph. 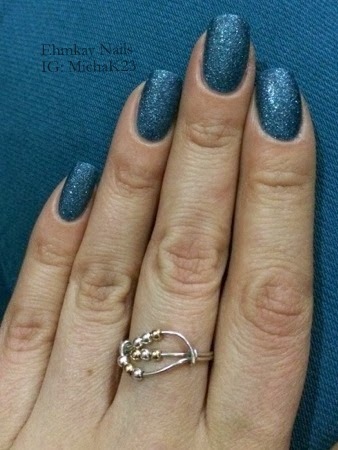 Ring: Three THIN coats of Essie On a Silver Platter. 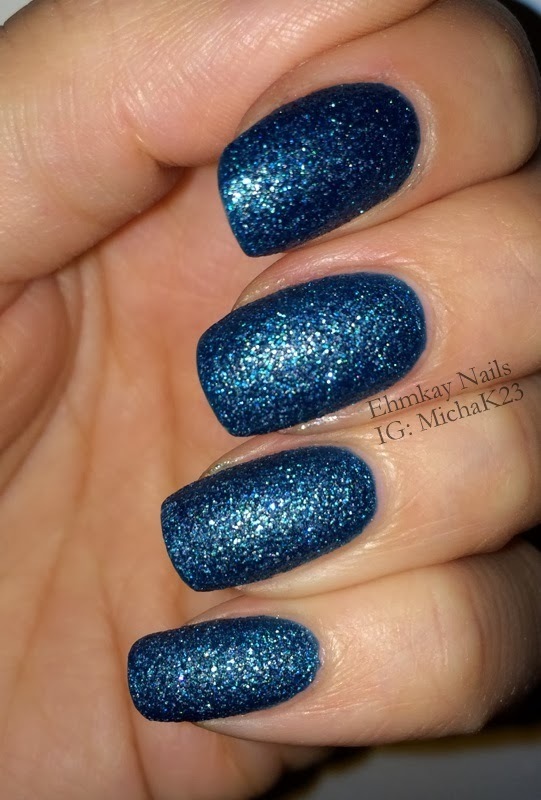 This has some awesome blue holographic glitter. I wish the sun came out for this. 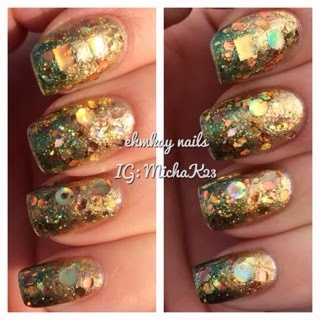 The last photo shows the holo. Thumb and pinky: Two coats of Essie Lots of Lux, a gorgeous texture polish (Essie should do more like this; it was really stunning). These type of blues are difficult to photograph. They are bright but not neon. 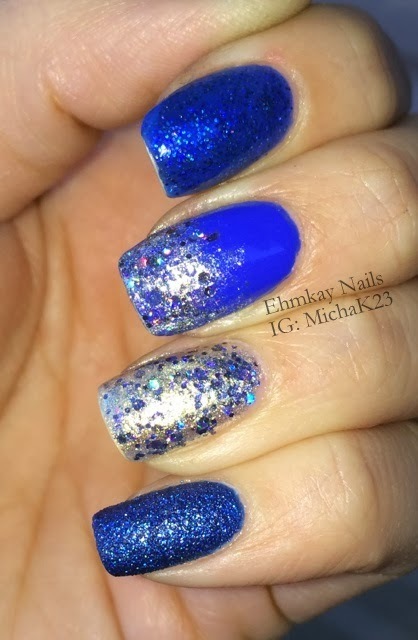 I really love how rich this blue is. Hope you like it too! If you didn't know by this post that I was addicted to textures, maybe if I tell you that I have added at least 20 more textures to my collection (there's no stopping this addiction), now you'll believe me. I missed out on most of the Kiko Sugar Mat polishes from their first set (I managed to find three of them this past August in France though). 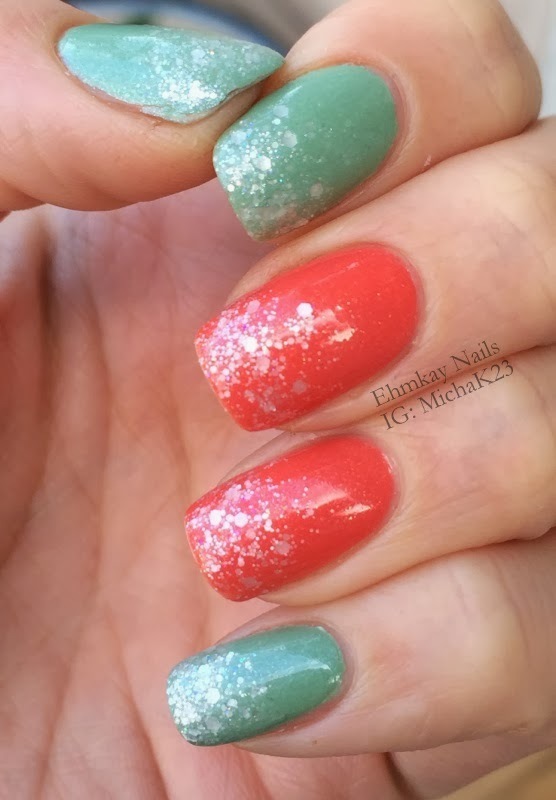 When I saw the Holiday Sugar Mat set, no swatches needed, I immediately set up a swap for them. And they are soooooo stunning. 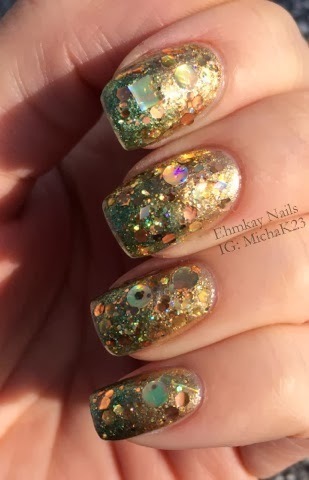 The Kiko Holiday Sugar Mats are all sparkly and stunning. I needed a quick mani change, and I chose the teal green to match my teal pants. 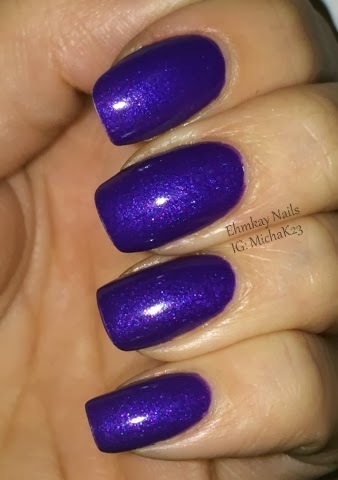 I can't believe how well this polish matched my pants! Two easy coats of Kiko Tea; Green (456). Dries super fast. Once it dries, the sparkle sets and it simply looks stunning. These also last so long, so if you need a manicure to last, use a texture! 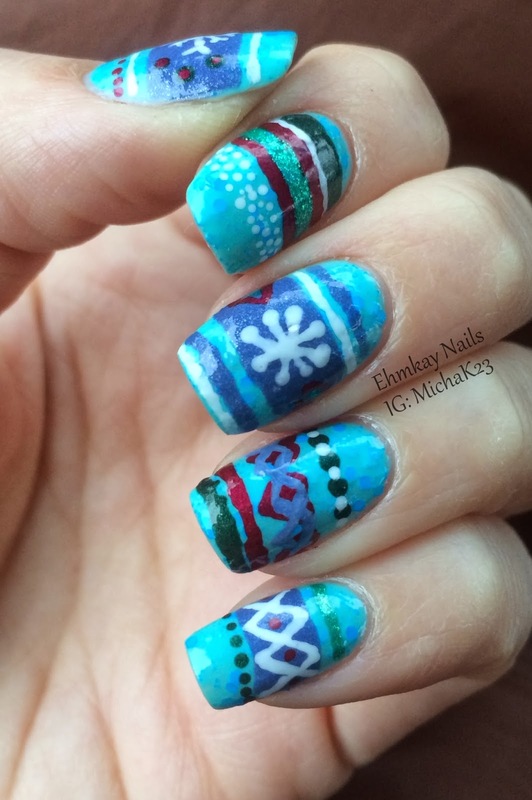 I like to think of this as a wintry manicure rather than a holiday manicure. 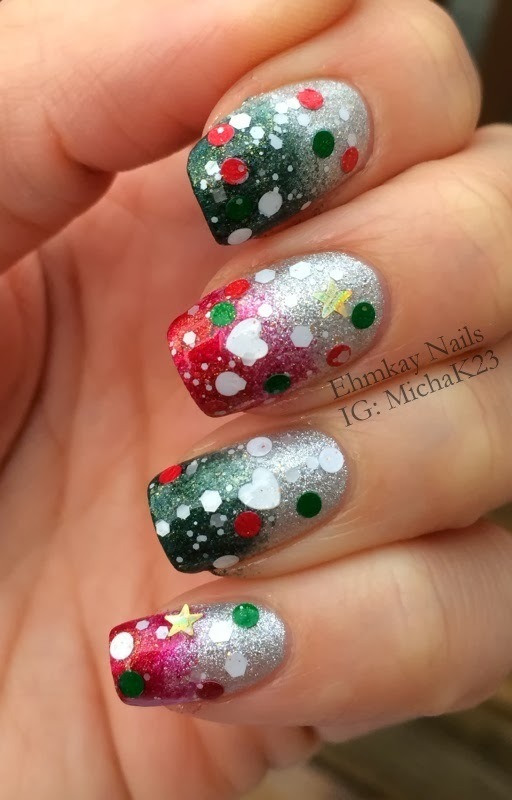 I wore it after the holidays, and did not care! I started with two coats of Layla Softtouch Marshmallow Twinkle. 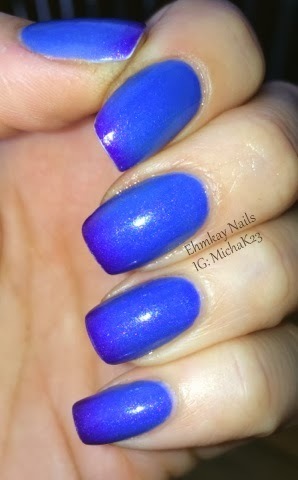 I love, love, love the Layla softtouch polishes. Alternating nails, I did a gradient using Revlon Emerald City (green) and Orly Torrid (red). Then I topped it with one careful, dabbed coat of Elevation Polish Yeti Loves the Holidays. 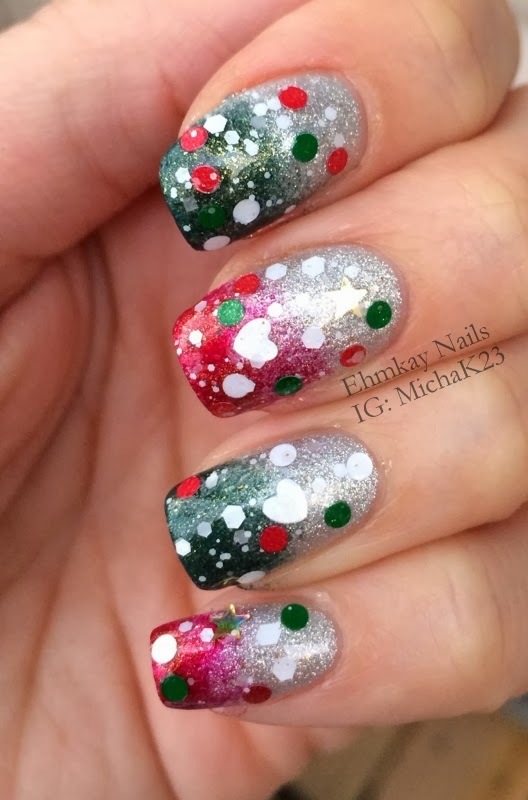 Easy, festive, fun. Not much more to say about this one! 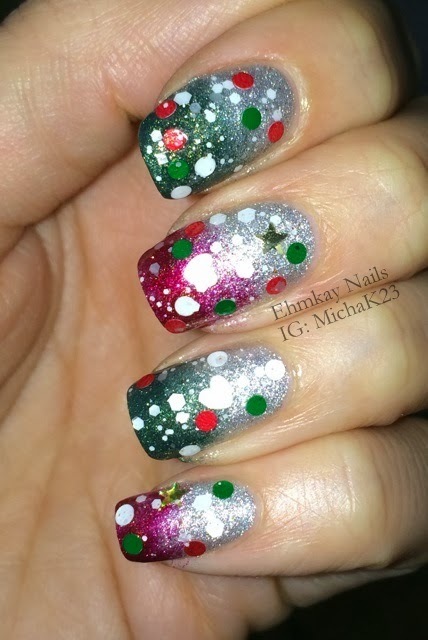 Do you only wear festive manicures during the holidays? I don't like to limit my seasons! In a Facebook group I'm in, we were discussing our love of Dior nail polish. Yes, they are pricier, but some colors are truly worth it! If you wear as much polish as I do, you know you have experienced some pretty terrible formulas. Well, I cannot say that for any of my Diors! So we are all posting a Dior manicure today! This Dior actually means a lot to me. It's an older Dior that was no longer available when I got into this brand. I saw it on ebay for over $40, and I just couldn't buy it. I lusted over it, constantly searching for new auctions. Well, an amazing woman in the mentioned Facebook group SURPRISED me with it. Let me tell you, I actually let out a shriek when I opened up the package, confused what it was. The nail community is JUST so amazing. Now the polish:Dior Mandarin Orange is a long discontinued color. 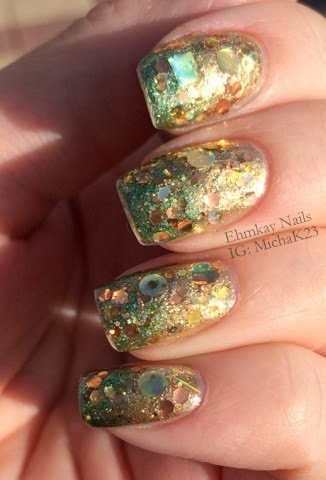 It's a peachy orange with gold shimmer and flakes and it is just so stunning. I decided to pair it with Rescue Beauty Lounge Liberty, which is a pale green shimmer (and was another super lemming). It was a weird combination but I think it works. 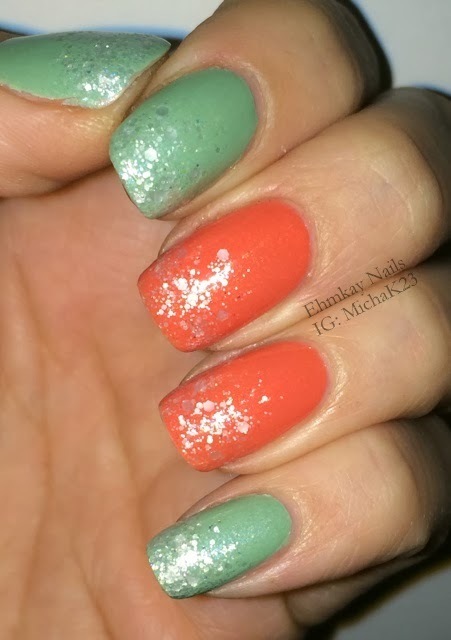 Lastly, I did a gradient using Cirque Colors Galinda, which is a satin white glitter. It was just enough not to take away from the gorgeousness of Mandarin Orange and Liberty. There was no sun, and outside shade was turning the orange more "orangey" than it really was. 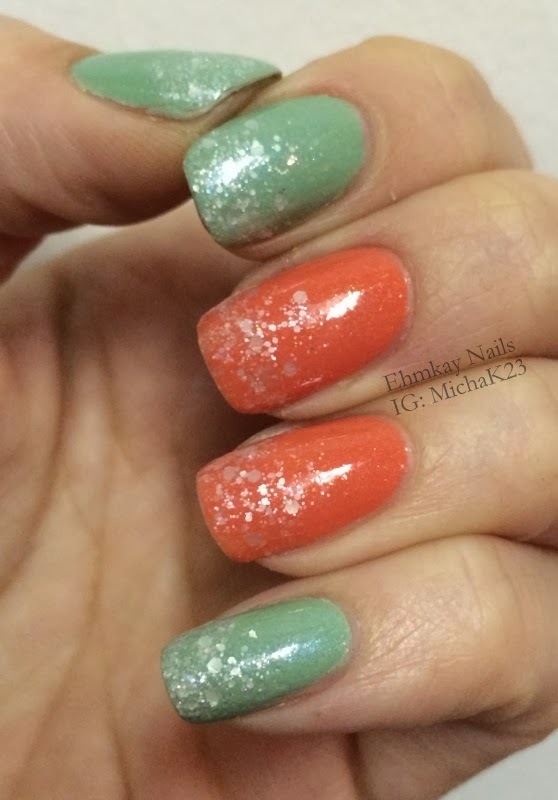 Although the inside pictures are more color accurate-- I've linked Pointless Cafe's swatches of Mandarin Orange. Same goes for Liberty; the indoor photos are more color accurate. Do you have any Diors? I have to admit, I had no idea I had so many until I looked what to wear for this post! Connect with me through the links below. Well hello, everyone! This past weekend there was a little widespread event on Facebook called #sharethelove which included the nail community sharing and posting each others' pages. It was really nice to be recognized by others and because of it, I surpassed 500 likes on Facebook. Keep checking my Facebook as I will be putting together a Valentine's Day giveaway in the next few days! 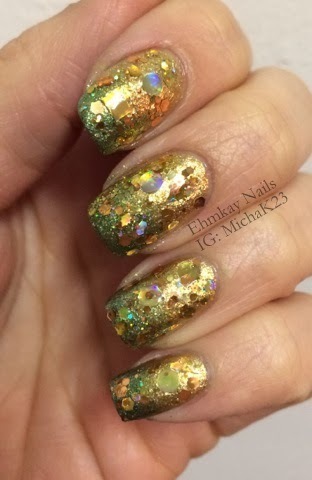 Today's post includes one of my favorite things, gold glitter! When I saw Emily de Molly's Hardware, I knew I needed it. Even though I don't care for gold jewelry, I love gold glitter. I was actually surprised with a mini getaway to Atlantic City, and I thought Hardware would be PERFECT! 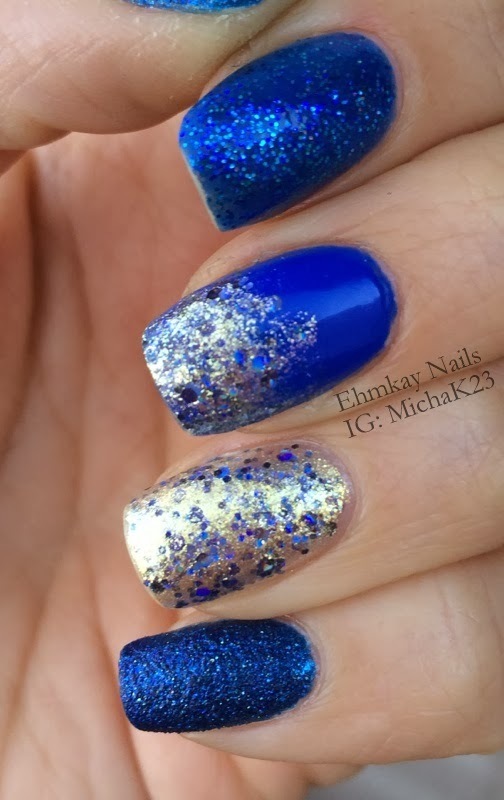 I started with two coats of Zoya Ziv--my favorite gold polish. 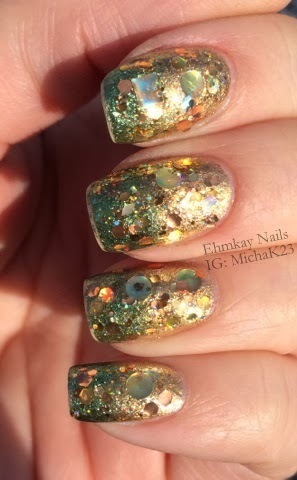 Because I wanted to make money in Atlantic City (and there are reflections of green in Hardware), I sponged Zoya Rikki on the tips. 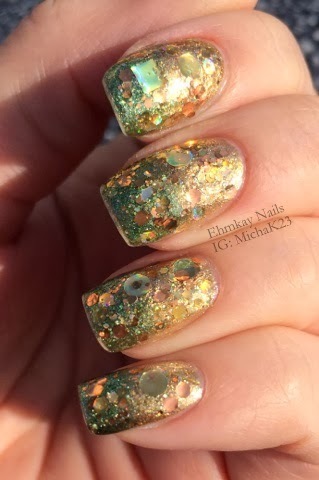 Then I added one coat of Emily de Molly Hardware, which is a phenomenal gold glitter with tons of gorgeous extra large circles and iridescent glitters. Because I can't stop, I added some of Lynnderella Golden Rules for additional shapes (the squares and stars are not in Hardware). These were so blingy, it was blinding! Unfortunately, I didn't win any money at the slots, but my nails did look fabulous! 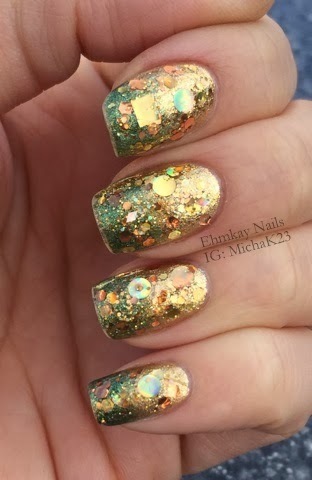 What are some of your favorite gold glitters? I NEED TO KNOW! Don't forget to keep checking my Facebook page for the giveaway announcement! 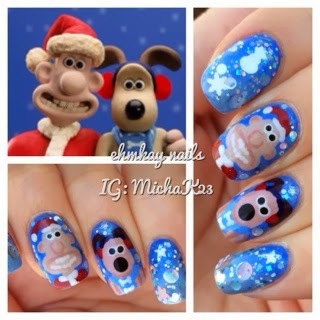 Wallace and Gromit Wintry Nail Art to Start 2014! Hello 2014! I went on a little blogging break for the new year and now I have tons of new manicures and art to show you, along with art from December I never got around to posting. I will also be posting some "oldie but goodies" from the vault---my poses might seem different, but the layering combos are too cool not to show! 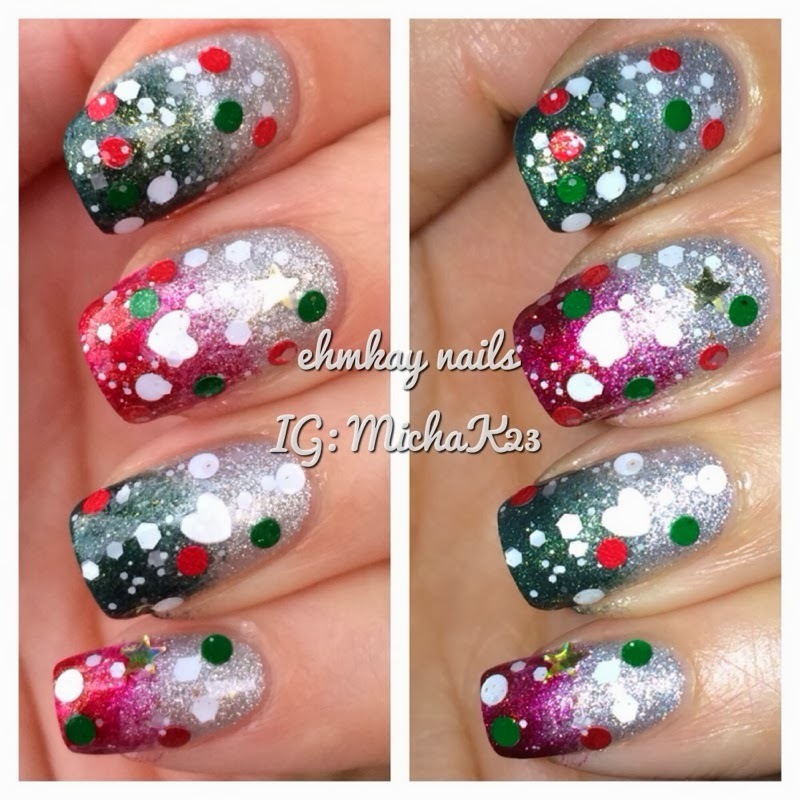 This manicure was actually my first for 2014! 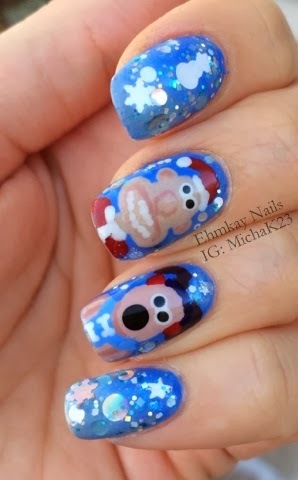 I wanted to do some Wallace and Gromit nail art to start off 2014. 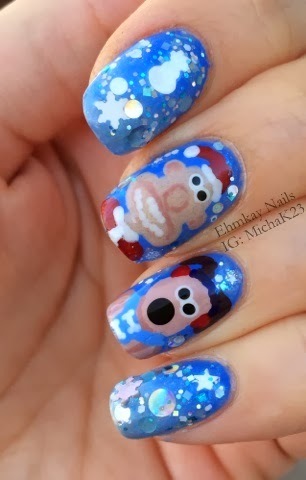 If you don't know who Wallace and Gromit are, you are seriously missing out! They are a claymation-based cartoon (and they STILL use clay, not computerized!) based out of the UK and I fell in love with them in 1998 on my first visit to England. I won't lie, I actually went to England in August to see Gromit Unleashed, where over 80 artists and celebrities painted huge Gromit sculptures for charity. The creators have made movies such a Chicken Run and The Curse of the Were-Rabbit that were released in the US. I really suggest you check it out! 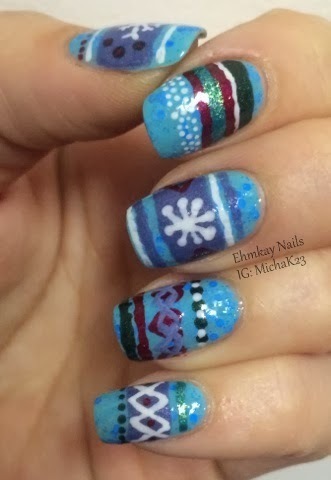 Anyway, enough about my W&G obsession--I chose a wintry palate. 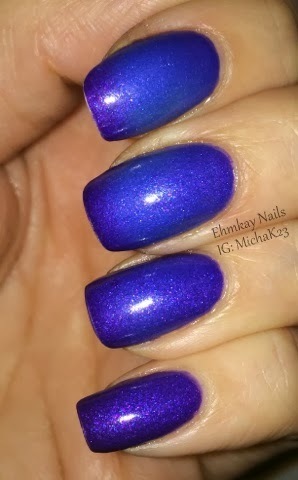 I used Illamasqua Noble as my base and did a gradient with Barry M Blueberry and Orly Boho Bonnet. Then I topped it with Different Dimension That's Snow Joke. I added snowflake and snowman glitter to finish the wintry scene. Then I went in and hand painted my Wallace and Gromit based on an image I think was featured on stamps in the UK. How cool!? 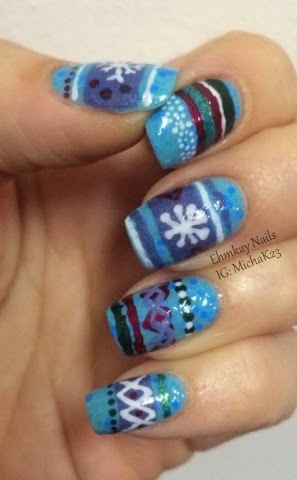 My right hand was simply the gradient, which I loved equally! 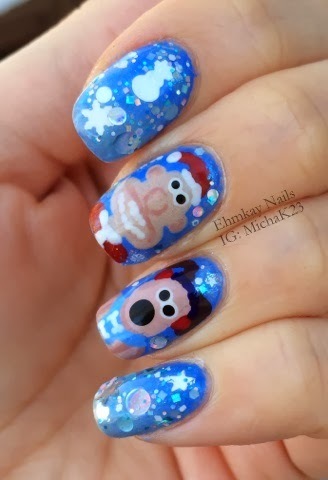 That's Snow Joke is a really great topper, especially with the added glitters of the snowflakes and snowman. 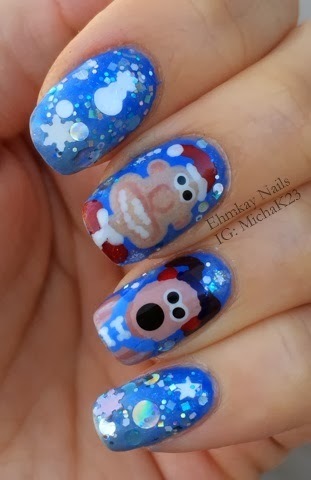 Do you think I did Wallace and Gromit justice on my nails? I hope you enjoyed my first post of 2014 and I have tons more to come! Don't forget to "like" me on Facebook and follow me on Instagram, which are linked below.